Yesterday, we talked about how the upcoming 2020 Jeep Wagoneer and Grand Wagoneer (WS) models will be based on the all-new 2019 Ram 1500 (DT) architecture. However, today we are going to talk about what to expect on the new full-size body-on-frame SUVs from Jeep. First off, our inside sources have told us that unlike the rumors on the internet of the Grand Wagoneer being a luxury trim on the new Wagoneer; there will be two models. Wagoneer will be a shorter wheelbase SUV, while Grand Wagoneer will have a longer wheelbase. The new Jeep twins will be similar to the current Chevrolet Tahoe and Suburban, GMC Yukon and Yukon XL, Ford Expedition and Expedition Max as well as the Lincoln Navigator and Navigator L full-size SUVs, offering two wheelbases. Our sources have told us that the new Wagoneer/Grand Wagoneer (WS) models that the new SUVs will get a lot of the new technology that debuted in the all-new 2019 Ram 1500 (DT) pickup. Wagoneer/Grand Wagoneer will get a modified version of the Ram 1500 air suspension as well as rear coils. We expect the frame to be made of the same high strength steel that the new Ram 1500 is being made of as well. The frame will also feature new electronically controlled side-frame-mounted active tuned-mass modules (ATMM). This will help reduce sounds inside the SUV. As for powertrains, we are being told that four (yes, four…) powertrains will be available in the Wagoneer/Grand Wagoneer lineup. Two of which will be the new eTorque mild hybrid systems on the 3.6L Pentastar V6 and 5.7L HEMI V8, they debuted with the 2019 Ram 1500 (DT) models. We will fill you in as we learn more about the other two powertrain options, in the near future. FCA US’ solid lineup of 8-speed automatics will round out the powertrain lineup. Of course, the Wagoneer/Grand Wagoneer (WS) models will be rugged off-roaders. They will feature the Ram 1500 (DT) pickup’s four corner air suspension for adding ground clearance on those though trails and electronic locking rear differential. These SUVs will also get heavy duty skid plating and electronic aides like hill-descent control to conquer what ever terrain is thrown at them as they will carry the Jeep “Trail Rated” badges on their fenders. While not much is really known about the interior, we do know it will get the latest Uconnect 4.0 systems that were shown in the 2019 Ram 1500 (DT). This includes the massive 12.1” Uconnect touchscreen, which will be optional. We are hearing that an 8.4” Uconnect screen is standard. We do know it will get a power liftgate, that will be motion activated under the rear bumper, 360-degree camera system, as well as an optional Uconnect Theater package similar to the one found in the Chrysler Pacifica minivan. Expect the standard features you have come accustomed to in the rest of the FCA US lineup as well, such as LaneSense Lane Departure Warning, ParkSense park assist with reverse stop, rear cross path detection and forward collision warning. As more information drops about the Ram 1500 based Jeep Wagoneer/Grand Wagoneer, we will be the first to tell you. So check back often for details. That answers one of my big questions on the Wagoneer/Grand Wagoneer. Have the Wheelbase configurations been released on the DT yet? For comparison here are the wheelbases of the competition. Chevy reg cab, 6.5 box, 119"
Chevy reg cab, 8' box, 133"
F150 reg cab, 6.5 box, 122"
F150 reg cab, 8' box, 141"
Crew Cab models grew 4 inches in wheelbase on DT while the Quad Cab stayed the same. Regular Cab 6’4 has a perfect wheelbase for the Wagoneer. Regular Cab 8’ has a perfect wheelbase for the Grand Wagoneer. I can tell you that this photo that was circulated a year ago and thought to be Wagoneer, isn't. It's of the upcoming WL Grand Cherokee. Was it not next to a current gen Grand Cherokee though? 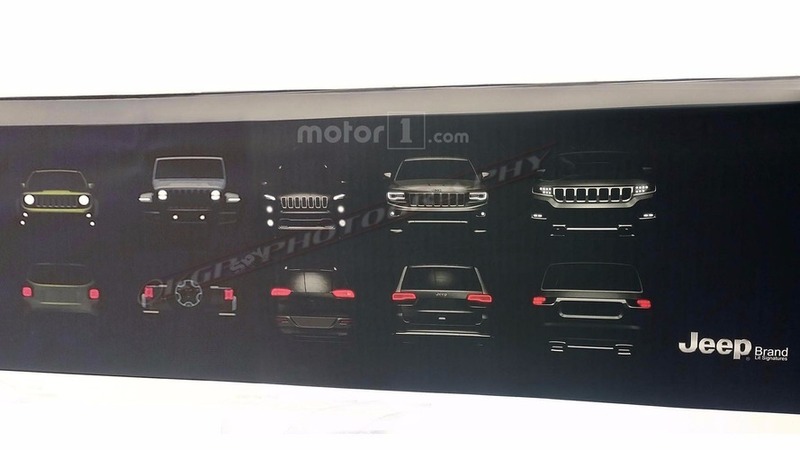 Why would they put individual models side by side, then have a duplicate for Grand Cherokee with separate gens? You get what I mean above right? Renegade, Wrangler, Cherokee, Compass?, Grand Cherokee? The one furthest to the right looks wider. I always figured it was the Wagoneer. Because it was a future design... its not 100% of what it will look like. But about 90% of what WL will look like. I have a feeling it was planned to be a Wagoneer design but was thought to be too similar to the Grand Cherokee so they decided to use it for that instead. Just speculating. Wonder if the split tailgate came ro be as they were working on what to do with the rear hatch from the Wagoneer. Can't wait for updates on this also.